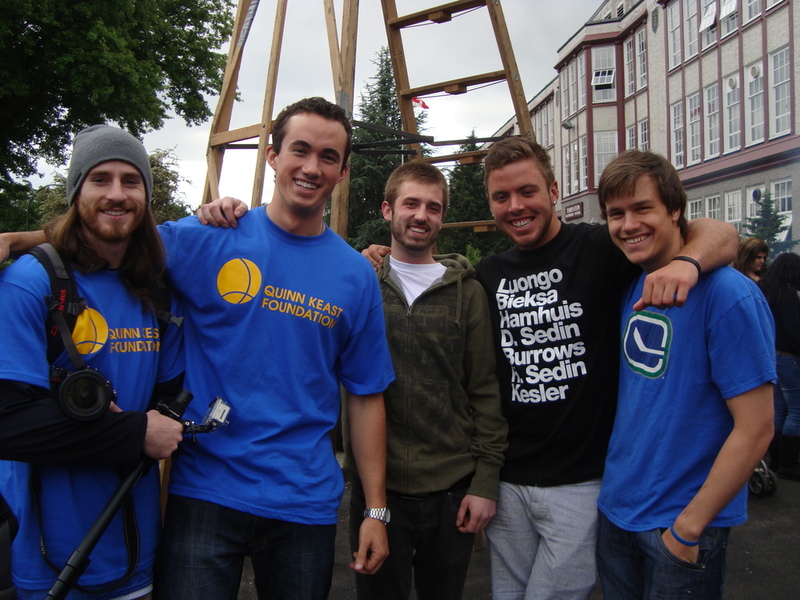 On June 10th, 2011 the Quinn Keast Foundation and Templeton Secondary School of Vancouver will host a celebration of the completion of three new basketball/ball hockey courts at Templeton. 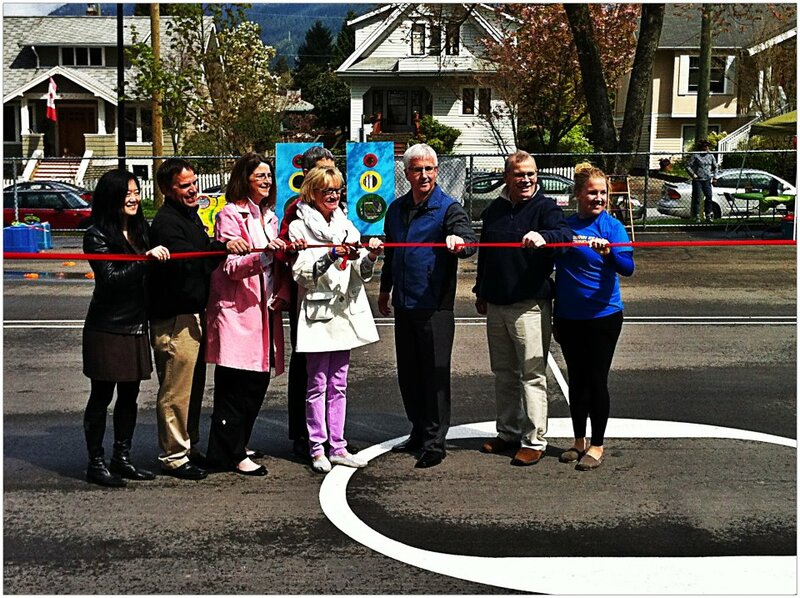 With funds from the QKF for some new hoops, Templeton’s Athletic Director Mike Allina jump-started a project which grew into new paving of the outdoor rec area, thanks to the Vancouver School Board, and the addition of six hockey nets courtesy of the Templeton Grad Council of 2011. Just as Quinn was passionate about the game of basketball and the Quinn Keast Foundation is passionate about supporting the game and it’s athletes throughout B.C., Mike is passionate about creating basketball and recreational opportunities for his students and the surrounding community. On the afternoon of June 10, basketball players and physical education classes of all ages will scrimmage on the three brand new outdoor courts: elementary kids from Templeton’s feeder schools at 1 pm, P.E. classes from Handsworth and Templeton at 2 pm, senior high school players at 3 pm and an adult set of games featuring alumni and Vancouver Police athletes. Quinn was a very committed basketball player leading up to his championship season in 2005/2006 at Handsworth. The new courts and this event is a tribute to what Quinn was most dedicated to and also is intended to encourage players and non-players of all ages to participate in the game. This day also marks the 5th year anniversary of Quinn’s passing. Quinn’s friends and family will wrap up the event shooting with the younger players on Quinn’s Court. There will be a BBQ and music throughout the event. Everyone is welcome. The official opening of the new Quinn’s Court at Queen Mary Community School on Thursday, May 22nd, 2014 was the culmination of celebrations this Spring for the rebuilt Queen Mary. Held as the highlight of the school’s volunteer tea, the court opening combined a ribbon-cutting with a an exciting game of scrimmage that brought the entire school population to cheers. Jan Keast shared with everyone some of her son Quinn’s special qualities as a student and an athlete, including his personal motto, to live each day with “no regrets”. Quinn died in a tragic accident in 2006 but his legacy lives on in scholarships and funding for Quinn’s Courts—Queen Mary’s being the newest. Even though the paint is barely dry on its lines, the court is already a popular spot to play and practice basketball in North Vancouver. The entire school community sat courtside to watch the Grade 7 girls vs. Grade 7 boys game, and cheered at every jump shot. At the end of the few minutes of exciting demo play the score was an even eight points each. A win-win for all the players! NORTH VANCOUVER, April 27, 2012—At 11 a.m on Saturday, May 5th, the North Vancouver Board of Education will host a ribbon-cutting for the new Quinn’s Court at Ridgeway Elementary School. The event launches Ridgeway’s annual spring fair and Centennial Celebration—recognizing the school’s place in the community for the past 100 years. The ribbon-cutting celebrates the generous gift of the Quinn Keast Foundation to help fund the creation of a new basketball court on the grounds of Ridgeway Elementary. The centre court features a “Q” incorporated into the lines— in memory of Quinn Keast, a remarkable young man and an exceptional Handsworth student and basketball star who died, in 2006, as a result of a tragic accident. Since that time the Keast family, and their many friends and supporters, have gone to great lengths to keep Quinn’s memory and inspiration alive, and to enrich the lives of others through the power of sport. The ribbon-cutting event will welcome members of the North Vancouver Board of Education along with the Keast family, City of North Vancouver Mayor Darrell Mussatto and generations of players from the local basketball community. The North Vancouver School District includes 25 elementary schools and 6 secondary schools, a distributed (online) learning school and a residential outdoor education centre. Over 16,000 students are currently enrolled in the School District for the 2011/12 school year. The Quinn Keast Foundation administers and enhances the Quinn Keast Memorial Scholarship Fund. The Fund was accumulated through donations from generous friends, family and members of the basketball and sporting community. “Quinn’s Courts”are an extension of the Foundation’s work to create basketball and sporting opportunities for students and communities.